I don’t blame the governor’s press secretary for not understanding exactly who made the decision to have Flint pump its drinking water from the Flint River. It was a complicated decision making process with multiple key players that lasted at least a few months. Back in the spring of 2013, when this decision was made, Governor Rick Snyder’s press secretary, Dave Murray, was one of “us”; a journalist working for The Grand Rapids Press/MLive. He was one of the familiar faces around town among the smaller group of reporters in Michigan’s second largest city. And let’s face it; none of us were paying close attention to the water decision that was going on 100 miles away in Flint. It wasn’t our beat, after all. But for the last 12 weeks or so, pretty much all I’ve done is try to answer a single, important question: How in the world did the “Flint water crisis” happen? The answer is so complex I couldn’t cram all the details into the one hour-long documentary I was tasked to write. Shameless plug – you can listen to the documentary “Not Safe to Drink” here. The first draft of the documentary included a very lengthy section detailing who made the decision to switch to the Flint River and the months long process that determined the city’s fate. But it got cut out. It got cut because we decided that detailing the city and state officials who had a hand in that decision, to some degree, doesn’t really matter. The bottom line is that the state regulatory agency responsible for overseeing water quality, the Michigan Department of Environmental Quality, should have ensured that water was safe to drink. The MDEQ failed on that front, we now know, to disastrous effect. We think it’s in the public’s interest to understand how that happened. By not requiring Flint to treat the river water in a way that would’ve helped keep lead out of the drinking water, MDEQ became the most important focus for the “accountability” portion of this documentary. Through months of research and lengthy, recorded interviews, my editors and I came to the conclusion that, had the water experts (specifically officials at MDEQ and the engineering firm Flint’s emergency manager hired), done a better job, then who made the decision to go to the Flint River shouldn’t have mattered. If they would’ve required corrosion control treatment, treatment any normal large city in America uses, treatment that the federal government has now made completely clear is absolutely required, the lead problems Flint has faced may not have ever happened. I don’t mean to be flip. Of course it matters who made the decision to switch to the river. But after that first edit, we decided we weren’t going to spend one third of an hour-long documentary hashing out the "who-did-what-when" on the financial side of this decision if the more imperative complex issue we needed to convey was the major screw-up on the water treatment side of the decision. Flint was broke -- like “nearing bankruptcy” broke. Flint had a string of these state-appointed financial hatchet men during this time -- trying to get the city’s finances straight. They were looking for savings everywhere, and they had their eyes on the expensive water they buy from Detroit, so when Genesee County decided to build a new water system, one that’s separate from Detroit, Flint was definitely interested in joining. Once it was clear Flint could save millions of dollars a year with the new system, Flint got on board. But there was a catch. The new water system wasn’t built yet, and it wouldn’t be ready until the summer of 2016, at the earliest. And once Detroit realized Flint was going to leave its system, it jacked Flint’s water rates up even more – to the tune of $10 million over the two years the new pipeline would be under construction. So in the spring of 2013, Detroit kind of had Flint over a barrel. It was state treasury officials who got creative. Forget Detroit, Flint’s emergency manager said. Let Flint get really cheap water from the Flint River. The governor’s press secretary, Dave Murray, called me Wednesday morning to take issue with this account. “That is simply not accurate,” he told me. With less than four hours until the documentary aired, I didn’t have time to argue. I had already had this discussion ad nauseam with his predecessor, Sara Wurfel, and with Treasury Department spokesman Terry Stanton. I referred Murray to my news director, Vincent Duffy. It is critical to note that Flint and Genesee Co. had been in discussions to start their own water authority for years before this decision was reached. They had been gathering information on a switch and leaning toward that decision far before the Gov. was even in office." Here’s what’s true about what the governor’s press folks are saying. Yes, Flint had an interest in joining the new Karegnondi Water Authority before Governor Rick Snyder was in office. Yes, Flint City Council voted on March 25, 2013 to join the Karegnondi Water Authority. But the governor’s press folks are either sorely misinformed or willfully blind to what happened after that vote. Months and months after dealing with us reporters picking apart this decision, they still don’t get it. I'm not breaking any news here. They should know this stuff by now. Some state officials continue to confuse Flint’s vote to join the Karegnondi Water Authority with the state appointed emergency manager’s decision to temporarily switch to the Flint River. I gotta be honest, after all the research I had done, I had a really rough time coming to terms with the fact that I simply did not have time in this documentary to recount the ins and outs of this decision more in depth. Even though it is super complicated, perhaps now is a good time to drag out the details. For the sake of Michigan Radio’s readers and listeners, and in response to the folks at the governor’s press office, I’ve taken another crack at breaking down this part of the story. July 2011: Rowe Engineering presents Flint City Council with a study evaluating the city’s options for drinking water. The high cost of water prompts city officials to study their options. The study looks at three options; staying with Detroit’s water, switching to the Flint River, and getting on board with the KWA, the new water system that’s now being built in Genesee County. The study shows staying with Detroit is the most expensive option in the long run. Switching to the Flint River is cheaper than Detroit in the long run, but making it a permanent source would require more than $60 million up front; to remove dams, to find ways to dispose of residuals from the water treatment process, and to upgrade the city’s water treatment plant. The most favorable option, the study found, was going to KWA. December 2011: Financial reviews show Flint’s finances are so bad, Governor Rick Snyder appoints Flint’s first emergency manager. To start it was Michael Brown, but there are four different guys who hold this position over the next four years. One thing to note, Treasury Department Spokesman Terry Stanton did point out that they also tried to figure out a way to blend Detroit’s water with the Flint River water, to save the city money. But those talks broke down. Detroit Water and Sewer Department Board Chair Jim Fausone told me that’s because Detroit was concerned that Flint wouldn’t be able to treat the river water properly. If there were any problems at people’s tap, it could be difficult to figure out which water source was causing problems. March 2013: Flint City Council votes in favor of joining KWA. The board does this even though it has no authority with the state emergency manager in place. April 2013: State treasury officials approve Flint’s move to join KWA. The same month, Detroit sends Flint a letter announcing Detroit would end Flint’s long term contract to buy water, citing a legal clause in the contract. Many times, spokespersons for Michigan’s Treasury Department, the Governor’s Office, and even Flint’s emergency managers themselves have erroneously claimed this is the point where Detroit “cut Flint off” from the water supply. Yes, Detroit notifies Flint it will give the city one year at the long term contract rate structure, but after that, it would need to negotiate another contract. The other, shorter term options were more expensive than the longer term deal. Detroit, by no means, kicked Flint off its water system, as many state officials have claimed. June 2013: Flint Emergency Manager Ed Kurtz hires an engineering firm “for assistance in placing the Flint Water Plant into operation using the Flint River as a primary drinking water source for approximately two years and then converting to KWA.” Later that week, people from that engineering firm, Michigan’s Department of Environmental Quality, Genesee County and Flint’s water department met to determine if temporarily switching to the Flint River was feasible. They decided “the Flint River would be more difficult to treat” but that it was a viable source. They said there would be “obstacles” to get everything in place before April 2014, when Flint’s contract with Detroit would end, but that it was “reachable.” Lastly, they decided, “with support from LAN engineering which works with several water systems around the state, quality control could be addressed.” I tried to talk to LAN engineering. They declined to comment. March 2014: Flint’s Emergency Manager Darnell Earley sends a letter to Detroit’s water system, refusing the final short term contract offer. It acknowledges the option to continue buying water from Detroit. But these short term offers would’ve cost Flint at least $10 million more over the two years it would take to build the new water system Flint will join next year. Instead, Earley writes, “the City of Flint has actively pursued using the Flint River as a temporary water source.” The only people with any authority over this decision were Flint’s string of emergency managers. Again, I’m not breaking any major news with this. The ACLU’s Curt Guyette has been nailing this point home for a while now. 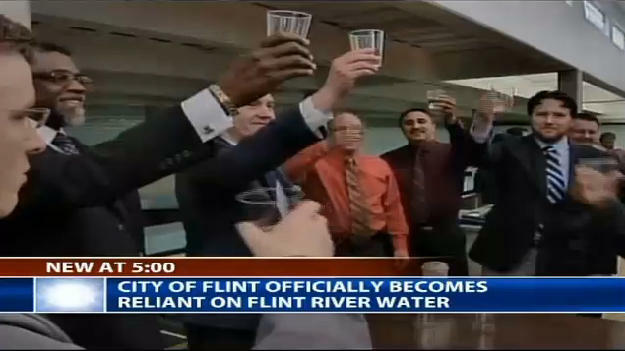 Flint officials toast each other as they flip the switch to get water for the city from the Flint River. Through his Freedom of Information Act Requests, he discovered the letter from Darnell Earley, declining Detroit’s offer to purchase water. He’s also caught numerous officials on video saying Detroit “cut Flint off” from the water system. Here’s a video that gives you an idea of the spin machine at work. The Detroit Free Press did a breakdown in late November too. They couldn’t find a document that determines exactly which person made the call to put the Flint River back on the table as a viable option. But, ultimately, Paul Egan highlighted the same two important documents I saw – the February 2013 report for treasury that says the Flint city leaders were no longer considering the river as an option and then the June 2013 decision from Ed Kurtz, to hire an engineering firm to prepare Flint’s Water Treatment Plant for the Flint River. Listen to part three of the Michigan Radio documentary Not Safe to Drink. If you missed parts 1 or 2 of Not Safe to Drink, you can find them here. Back in September, research scientists from Virginia Tech came to Flint to break some bad news. Their tests showed high levels of lead in people’s tap water. Lead is especially harmful for young children. Listen to part two of the Michigan Radio documentary, Not Safe To Drink. If you missed part one of Not Safe to Drink, you can hear it here. The tap water in Lee Anne Walters’ home in Flint was causing her family’s health problems. Tests show her water had extremely high lead levels. Her son Gavin was diagnosed with lead poisoning.